As you might have guessed from some of my previous blog posts, I'm an avid paddler. I like to paddle boats, and I like to try to go fast! And when I'm considering buying a new boat, it's only natural that I would analyze the data to make an informed decision. 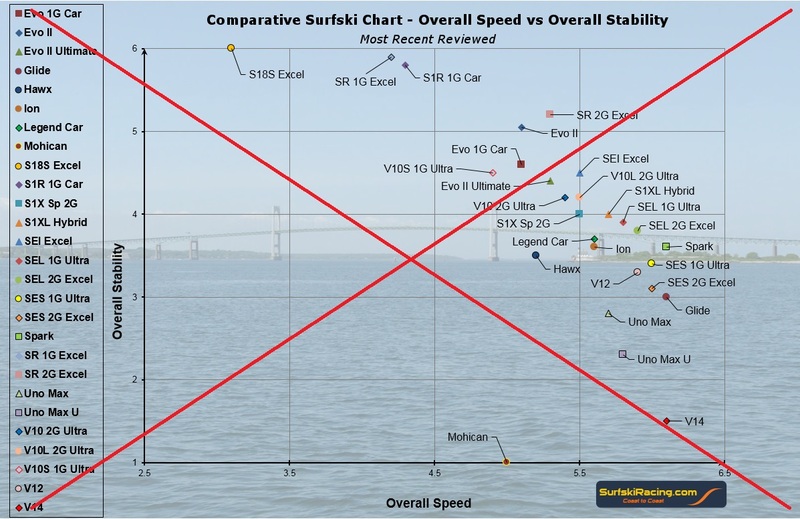 Follow along as I analyze the trade-offs between speed and stability while trying to decide whether to buy a new boat. The boat I've been paddling lately is a surfski. A surfski is a long/skinny sit-on-top kayak. It goes pretty fast (because it's long and skinny), and it's suitable for paddling in the ocean (since it's a sit-on-top, and you don't have to worry about the cockpit filling with water). But one thing about a skinny kayak is that it's also tippy (if you don't have good balance and paddling skills, it can tip over). The surfski I'm currently using is a 20ft Epic V10 Sport. It's a composite hybrid of fiberglass, carbon fiber, and Kevlar, and a bit wider and heavier than the surfskis the pros use. 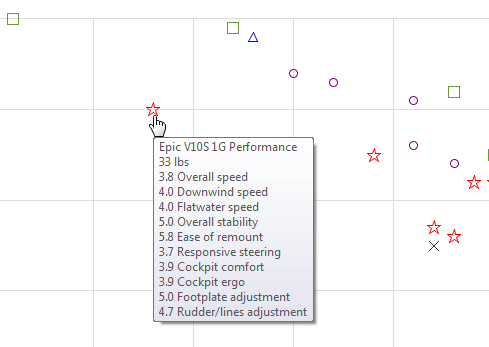 If I paddle hard, I can generally go 5.5 to 6.5mph in my V10S. That's pretty fast, but still a bit slower than my buddies who paddle Olympic-style K1 sprint kayaks ... and I hate to lag behind when they let me practice with them. 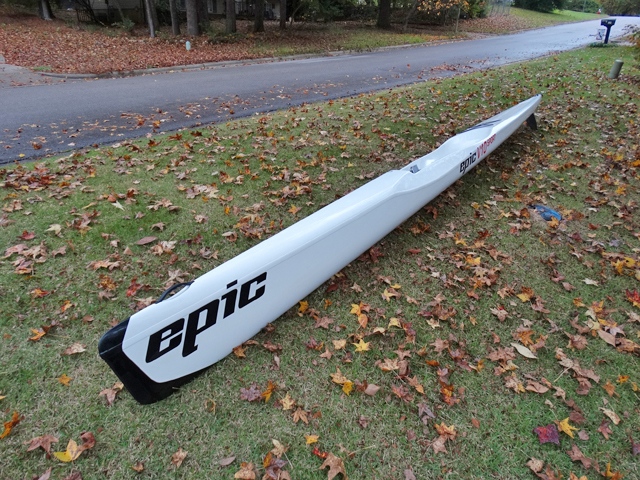 Therefore when the opportunity to buy a used Epic V12 Ultra surfski popped up, it piqued my interest. It's a foot longer, 2 inches more narrow, and about 7 pounds lighter than my boat ... and reputed to be a good bit faster! But with more speed comes less stability ... and you can't go very fast if you keep falling out of your boat! Eliminate the background picture of water. It's pretty, but it distracts from the data. 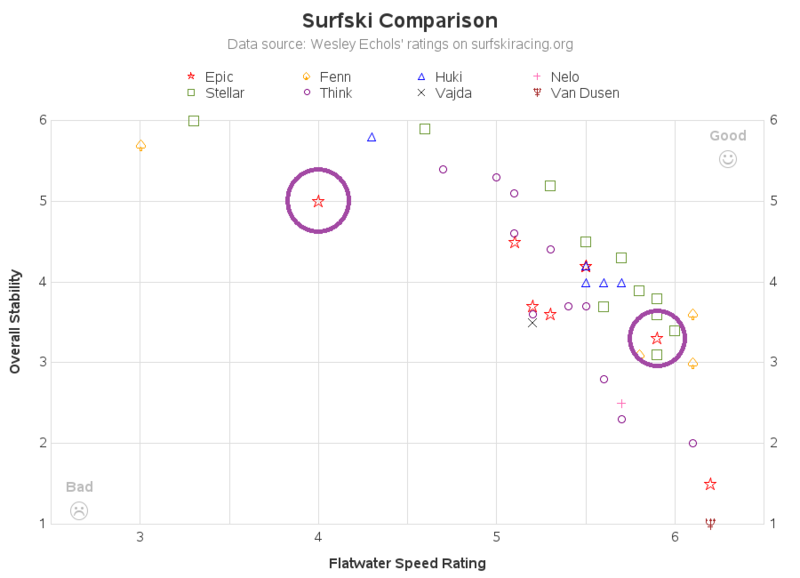 Plot all 42 boats on one graph, rather than several graphs with subsets. With more dense plot markers (42 of them), it would be impractical to label all the markers on the graph - therefore I planned to add HTML mouse-over text, using Proc GPlot's html= option. I will be able to include the brand, model, and construction (type of material) in the mouse-over, as well as the values of all the various ratings. Rather than having a unique color and shape for each marker (which is too many for a person to keep track of visually), I plan to use a single shape/color for each brand. Use outline markers, rather than solid filled ones, so it is easier to tell if there are overlapping markers in the same location. Label the stability axis on the right-side of the graph (using Proc Gplot's plot2 statement), since most of the markers are near that side. Add labels (using annotated text and Unicode face characters) showing which direction is good, and which is bad. Here's the graph I came up with. Click it to see the interactive version with the mouse-over text. Never heard of surfskis before. Now I want to learn more. 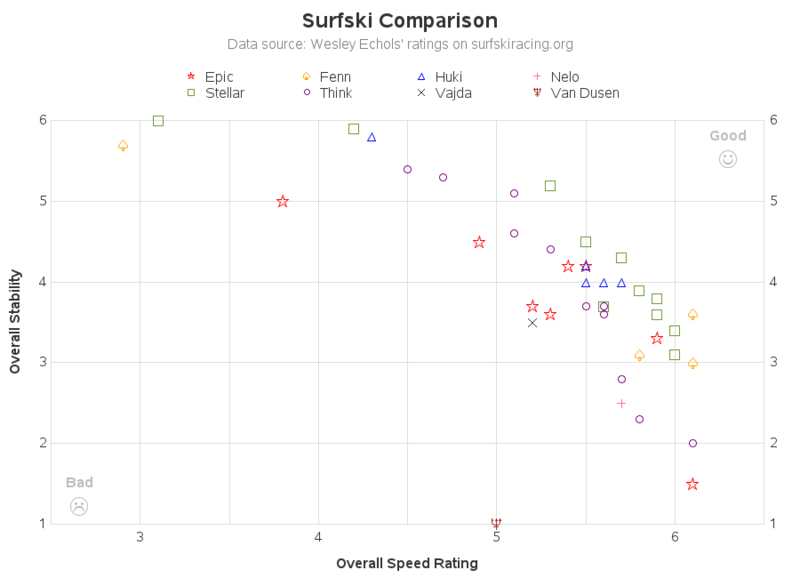 One thing I think would enhance your analysis is adding the cost of the surfski in the mouse-over info. I guess a take away for me in your visual example is that we need to help SAS customers draw insights and make decisions from data quicker. What is known, based on industry information, is that the V12 is narrower (probably lighter) and quicker based on design, and less stable as a result. A recommendation therefore might be that you set that information as baseline and initially start investigating all other correlates to speed and stability. Maybe machine learning algorithms can drill down on other metrics for us. What would be your study design approach to finding these correlates from information that exists today, based on general boat, SUP or kayak design? Is displacement at issue? How did your test go? Curious to know if you got the extra 1mph?